I love wind chimes. They are a peaceful way to remind us of all the forces in nature that we can’t see. Wind and water are the two most calming elements in the garden. You can use both to create DIY backyard projects to add relaxation to your backyard. Make your own DIY wind chimes! 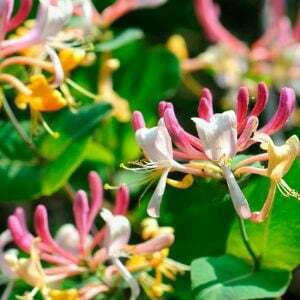 Then hang them on your porch or patio, in a tree, or from a fence to add that little tinkle of happy sounds all through your garden space! So, you ready to get crafty? Let’s learn how to make wind chimes! Our first project is from ‘Inner Child Giving‘. This is a simple tutorial for their key DIY wind chime. I love the bright colors they use, and also the simple and repurposed materials. You could choose a more subtle color scheme as well. This hardware store hanging DIY wind chime from ‘Instructables‘ is an inexpensive project. 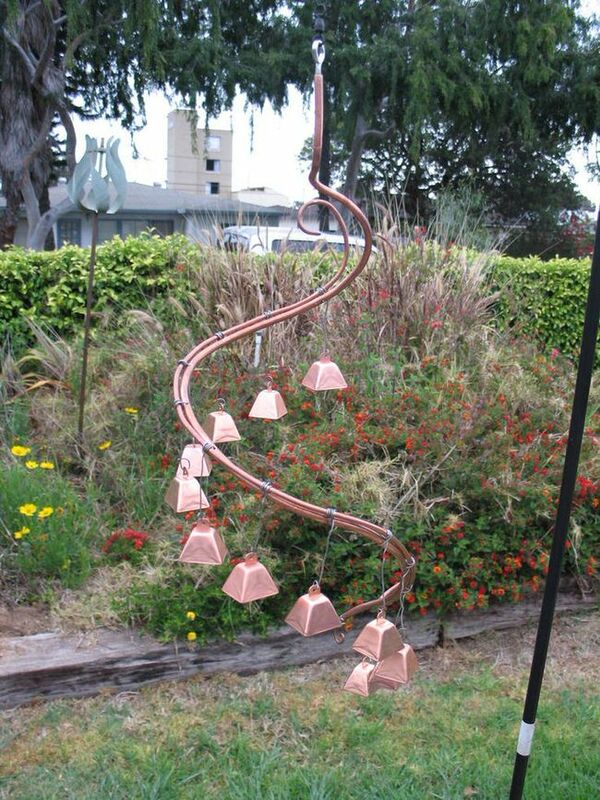 Made from copper tubing and the little copper bells meant for fishing, this is a pretty clever use of materials. From ‘Martha‘, this short, easy tutorial shows you how to make simple seashell DIY wind chimes, perfect for an after vacation project with the kids! A more extensive tutorial on how to make seashell wind chimes, by ‘Kleas‘. Step by step photos are easy to follow. They use embroidery floss instead of string, which I like because it ties easier. I think I would go for less color, but you can make it your own! This flower pot outdoor wind chime by ‘Lowes‘ is so cute, and super easy. Made with nothing but clothesline, flower pots, and a key! Paint it like they did, or leave it natural. Because remember, it’s your wind chime project, so make it your personality too. 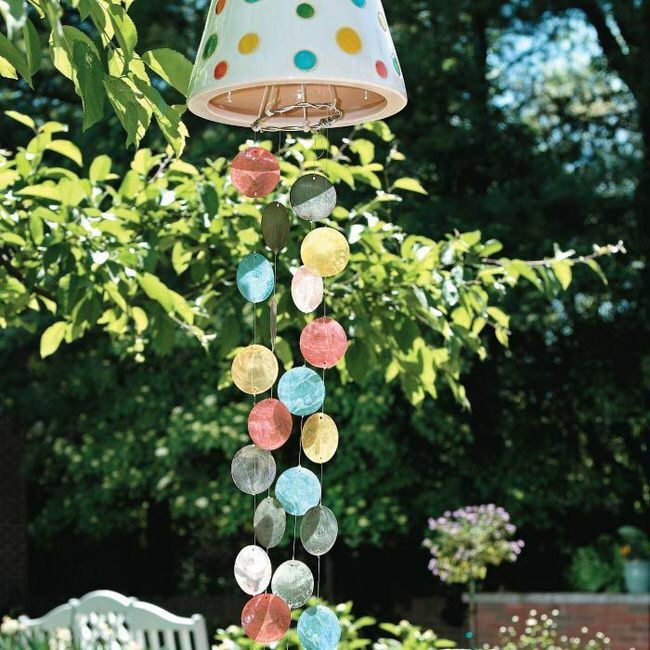 Create these colorful DIY wind chimes with the tutorial by ‘My Home My Style‘. A flower pot and pretty shells, I can just hear the delicate sound this chime would make! 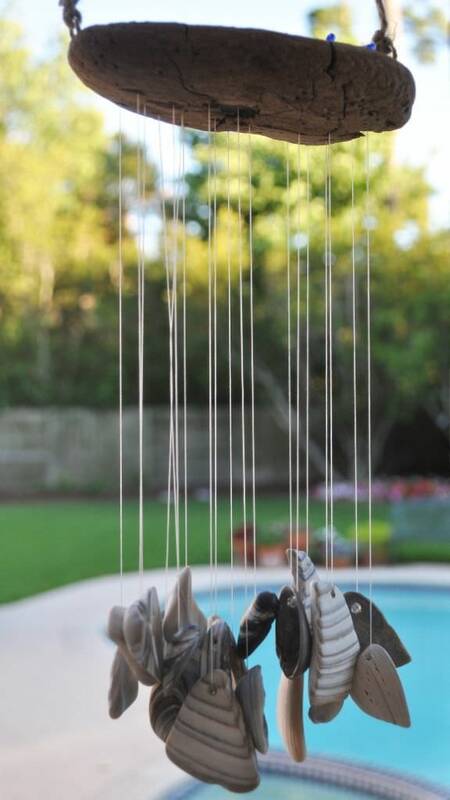 From ‘Michelle Made Me‘, this unique wind chime is simply bamboo stakes and pretty painting. I love how bamboo sounds striking in the wind. 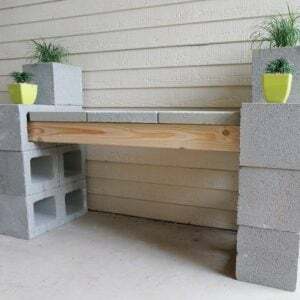 Since this project is also so artsy, you will be proud to show it off closer to a patio or sitting area. ‘Free People‘ has another take on how to make wind chimes from bamboo. They have directions on making a more natural version, and I love these ones using feathers as well. Lots of step by step photos. This bottle cap wind chime is from Krafty Katreena’s Etsy shop, and totally worth the buy. You could try making this yourself using a sink strainer top with an eye bolt, and jewelry findings (called jump rings) to string the bottle caps together. Another inspirational idea, this bottle cap DIY wind chime is from, ‘From the Alley to the Gallery‘. More inspiration, from ‘Home Sweet Homemade‘. 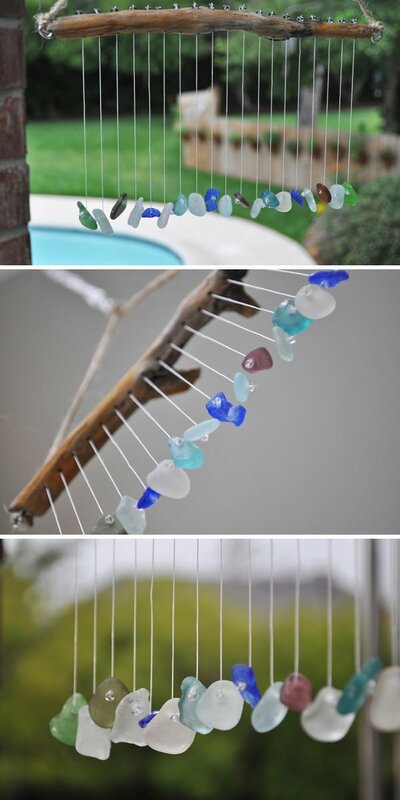 This sea pebble wind chime DIY has such beautiful colors, and I think just listening to it would remind me of the beach! Another one from “Home Sweet Homemade‘, this driftwood wind chime is beautiful. Another example of unique wind chimes! Our last DIY project is from ‘Maker Mama‘, and it’s easy enough to make with the kids. 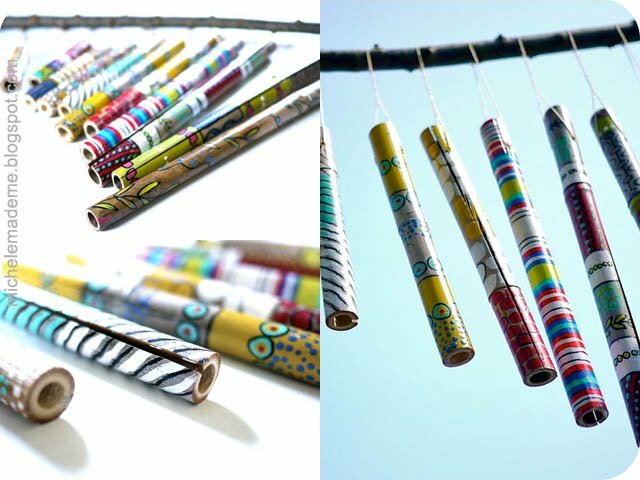 These recycled DIY wind chimes use tin juice caps and wire hangars! Enjoy your wind chime crafts! 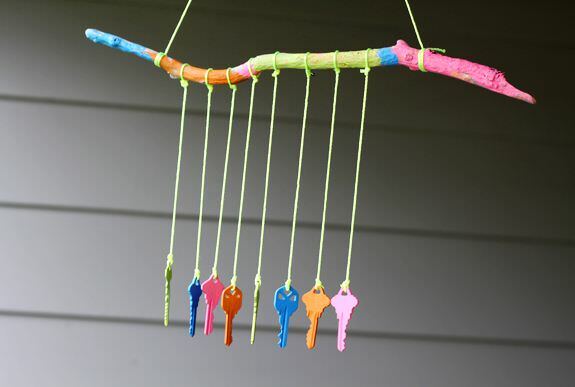 If you loved our post on 13 Craft DIY Wind Chimes, then we think you will want to hop right on over to DIY Rain Chains or 15 Easy DIY Projects to Make Your Backyard Awesome! Old silverware from the thrift store has a beautiful sound. You can test before you buy by holding two pieces loosely by the handles and let them swing into each other. flea market finds – child’s metallophone/xylophone. Take the metal bars off and string up as wind chime. They are colorful as is and most instruments have a great sound. Thanks Trish for the information! Readers? Ideas for Kathy? We’ll look into it ourselves!